What is obscene about this bailout is that it doesn't address the structural defects in the U.S. banking system. 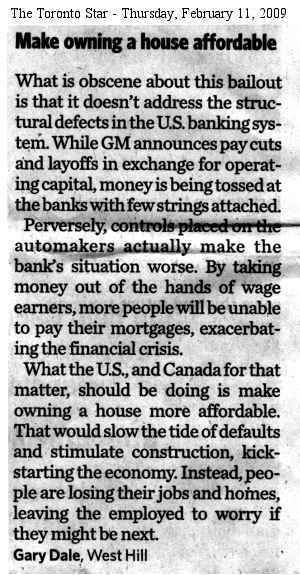 While General Motors announces pay cuts and layoffs in exchange for operating capital, money is being tossed at the banks with few strings attached. What the U.S., and Canada for that matter, should be doing is make owning a house more affordable. That would slow the tide of defaults and stimulate construction, kick-starting the economy. Instead people are continuing to lose their jobs and their homes, leaving the employed to worry if they might be next. Obama may have rode into office on a wave of desire for change, but his actions on economic stimulus make him look an awful lot like Bush.